From café bars to restaurants and bistros, Swansea City Centre offers a fantastic choice of quality eating to suit all tastes and pockets. Exotic flavours from around the globe, and for something traditionally Welsh, try the local seafood speciality – laverbread – a kind of pureed seaweed! 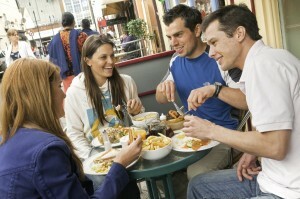 The City Centre offers plenty of opportunity to sample Welsh food at its very best. Many of the restaurants have qualified for the Taste of Wales award in recognition of their commitment to Welsh cuisine and use of fresh Welsh produce. Swansea Market in Oxford Street has, for decades supplied the City’s restaurants with a vast selection of fresh local produce, ranging from locally caught seafood including sewin, lobsters and cockles to Welsh lamb, cheeses and organic vegetables. For more information on the city’s café’s, pubs, restaurants, or nightclubs visit the pages on this site.